HARRISBURG – Mayor Eric Papenfuse will hold a press conference at 10:30 a.m. on Wednesday, October 10, at the MLK City Government Center to announce the details of fall leaf collection. 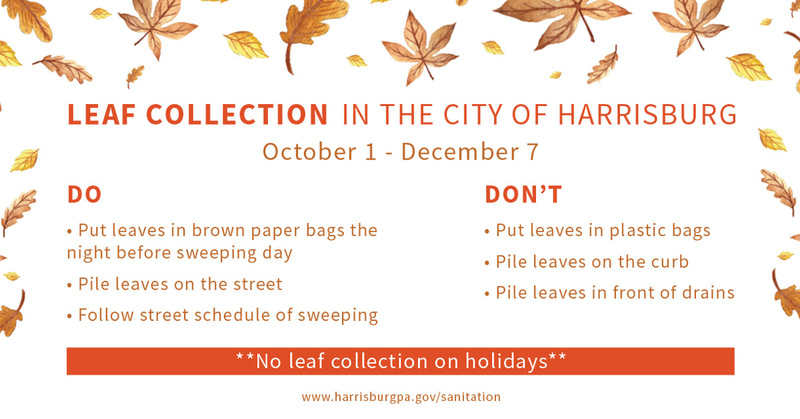 The City of Harrisburg Public Works Crew will work to make sure the leaves are collected quickly and efficiently. Capital Region Water will be in close coordination with Public Works to continue street sweeping during leaf collection. Residents are requested to help by putting leaves in brown paper bags at the curb the night before street sweeping. There is a limited number of free paper leaf bags for residents to pick up at the Public Works Center at 1820 Paxton Street between the hours of 7:30 a.m. and 4:00 p.m. You can also buy the bags at most hardware and home improvement stores. Plastic bags are not accepted at the composting site. If you are unable to bag your leaves, you can pile them into the street the night before street sweeping. Please be sure not to block drains. Blocked storm drains can cause puddles or flooding when it rains. The City will collect leaves between now and Friday December 7, 2018. Please follow the posted street cleaning schedule even if your collection day is a holiday. There will be no leaf collection on holidays. If you have any questions, please call The City at 311 for leaf collection questions or Capital Region Water at 888-510-0606 for street sweeping questions.